Macular degeneration supplements provide you with the most important nutrients, antioxidants, vitamins and plant extracts that your eyes need daily for a healthy vision. 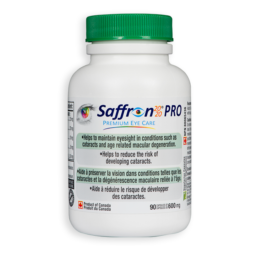 Approved by Health Canada and patented, our high quality saffron supplements help you maintain your eyesight in age-related macular degeneration (AMD). 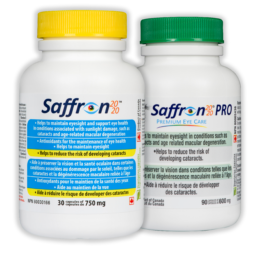 Premium nutrients support your healthy vision with saffron, the spice of sight! You may be panicked to hear that you have age-related macular degeneration (AMD) or cataracts. Nothing is more devastating than the idea of losing your eyesight. Are you concerned about age-related macular degeneration (AMD)? As recent research has shown, prevention is the best medicine when it comes to eye disease. Controlling risk factors like smoking, diet, and sun exposure can help. So can the right nutritional support. Discover macular degeneration supplements, backed by Health Canada claims, that help support your eye health and maintain eyesight in age-related macular degeneration (AMD). 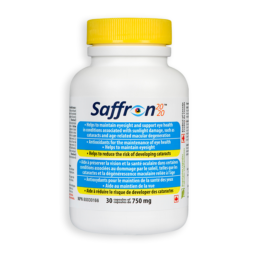 Premium Saffron supplements help you maintain your eye health. The Success Stories Speak for Themselves. See for Yourself! Get the Eyecare You Need, Today! With vitamins (A, B2, C, E), minerals and plant extracts. 30 capsules per bottle = 1 month supply. Health Canada approved eye supplement to help maintain eyesight. Without vitamin A, vitamin B2, vitamin E, zinc & copper. 90 capsules per bottle = 3 months supply. A complimentary product for those already taking other eye supplements. Vision supplements for macular degeneration, approved by Health Canada. Age-related macular degeneration (AMD) is the leading cause of blindness in people over 50. Discover how to protect your eyesight in AMD. Maintain your vision and your independence, and see the future, bright and clear. Stop cataracts from clouding your vision. Cataracts now begin at an earlier age, and is a leading cause of vision loss. Discover how to reduce your risk of developing cataracts, so you can work, play and live your life to the fullest. The right nutrients can help reduce your risks of cataracts and support your eyesight in AMD. Discover the most important eye health nutrients, backed by research and Health Canada claims. If you are not satisfied with your results, we’ll give you your money back. 100% GUARANTEED. Your FREE bottle will be shipped automatically, worldwide! We'd love to hear from you or help you with an order!